"They want to take all of this out," said Anderson, who sits on the steering committee of a local environmental organization, Save Rural Angwin, named for a community in the renowned wine country of the Napa Valley. She is studying a project-planning map of the area as she waves her free arm toward the wooded upward slope. "It looks like this will be the edge of a block of vines," she said. In Napa County, neighboring Sonoma County and farther to the north in the Willamette Valley of Oregon, concern is growing among some residents, environmentalists and scientists about the expansion of vineyards into forested regions and the impacts on watersheds and biodiversity. In Napa, an aerial view reveals a carpet of vines on the valley floor, which is why winemakers hoping to plant new vines increasingly turn to land in the county’s wooded uplands. At these higher elevations, "about the only thing standing in the way of winemakers are the trees," said Hackett. "Napa is getting really carved up," said Adina Merenlender, a conservation biologist at the University of California at Berkeley, who began studying the ecological impacts of vineyard conversions in the 1990s. "We see it all over the western and eastern ridges — it’s been relentless." The transformation of shrub, oak and conifer habitat into new vineyards threatens wildlife migration corridors, she said. "We’re down to the final pinch points," said Merenlender, referring to narrow corridors that eventually could become functionally severed from the relatively expansive wilderness areas in the mountains north of Napa County. Federal fisheries scientists also have expressed concerns that the wine industry is harming endangered populations of steelhead trout. The creeks flowing off the hills of Napa County are critical to remnant populations of steelhead and salmon, and biologists with the National Marine Fisheries Service (NMFS) say the irrigation of vineyards has reduced stream flows and clogged waterways with eroded soils. "Extensive water diversions, groundwater pumping, and increased agriculture (vineyards) water use during the dry season have reduced the extent of suitable summer rearing habitat … throughout much of the Napa River watershed," NMFS scientists wrote in the Napa River chapter (PDF) of a 2016 report. Those in the wine industry say environmental activists exaggerate the impacts of planting and maintaining vineyards. Winemakers contend that their industry has proven over the decades that it is sustainable, and argue that if there weren’t grapevines in Napa there could be something far worse from an ecological point of view: The vast suburbs and tech campuses that have overtaken Silicon Valley, once a major producer of fruit but now the fertile grounds for the U.S. tech industry. 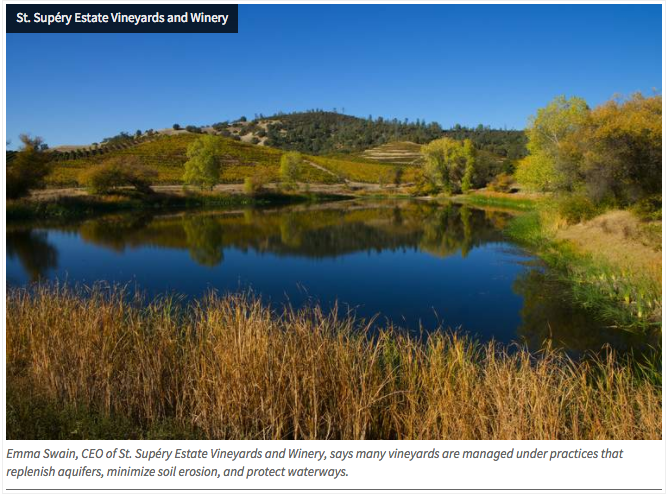 Emma Swain, board member with the trade group Napa Valley Vintners and CEO of St. Supéry Estate Vineyards and Winery, said many, if not most, existing vineyards are managed under practices that replenish aquifers, minimize soil erosion and generally protect waterways. The industry, she said, is not expanding as rapidly as conservationists contend. Joshua Viers, a watershed scientist at the University of California at Merced, noted in a 2013 paper, "Vinecology: Pairing Wine with Nature," that vineyards in the Mediterranean climate zones outside of Europe — primarily California, Chile, southern Australia and South Africa — expanded rapidly, from roughly 1 million to 1.7 million acres, in a 22-year period from 1988 to 2010. The boom, which has since slowed, has contributed to "alarmingly high rates of habitat conversion and fragmentation," according to Viers and his colleagues. But that same paper, published in the journal Conservation Letters, called wine production "an industry with many environmental leaders" who often practice sustainable agriculture "because of the visibility and economic importance of their crop." The paper went on to point out "a fortunate coincidence … that the very environmental components that are perceived to help create high-quality wine grapes — diverse soils, microclimates and topography — are also those that give rise to biodiversity" in many wine-producing regions. In an email, Viers noted that one factor that could dissuade some Napa growers from setting aside land for conservation are the valley's soaring land prices. In recent years, concerns also have grown about the impact of the rapid expansion of vineyards on native ecosystems in Oregon's premier wine-growing region, the Willamette Valley. The number of wineries in the valley has soared from 49 in 1987 to more than 500 today. Throughout Oregon's wine-growing regions, centered in the Willamette, the area occupied by vineyards has exploded from about 1,200 acres in 1981 to about 30,000 acres. Local conservationists are working to safeguard the Willamette's remaining oak forest from vineyard conversion. About the only thing standing in the way of winemakers are the trees. "You're starting to see a real conflict between new vineyard development and the last stands of oaks," said Nicole Maness, who heads the resilient habitat program with the Willamette Partnership, a conservation group. Her organization is encouraging growers and other landowners to join the Oak Accord, a voluntary pact to spare the valley's remaining oak trees. According to a state wildlife management plan, oak woodlands in the Willamette Valley have been reduced by agriculture and development from 400,000 acres historically to roughly 20,000 today. Greg Jones, an environmental scientist with Southern Oregon University, said Oregon has become attractive for winemakers who see the state's relatively cool climate as a sort of agricultural refuge from warming trends that scientists expect will make some regions to the south too warm to grow premium grapes. The ecological impact of vineyard expansion has created controversy in other important wine-growing regions worldwide. The Argentine Dryland Research Institute has blamed Argentina's wine economy, and its use of water in arid regions, for accelerating desertification in the province of Mendoza. In established wine-growing regions of Europe, deforestation and grape cultivation on mountainsides have raised concerns about erosion. For instance, severe autumn flooding in 2014 in the northern Italian region that produces the sparkling wine prosecco, was attributed to grape growers who had cleared forests — a contention winemakers refuted. Winemakers question the authority of conservationists on private land. Swain of Napa Valley Vintners said that "due to existing regulations, it's super difficult to develop new vineyard land," adding that most of Napa County's forests probably will remain intact forever. "It's too steep in a lot of places to plant vineyards," she explained. In her view, Napa County is nearly "planted out," with very little suitable space remaining to plant new vineyards. Napa County covers more than 500,000 acres, of which about 45,000 acres are planted in vines — nearly four times the acreage of 1970. (Hay, vegetables, and other crops currently cover only about 1,500 acres in Napa County.) According to David Morrison, director of Napa County's Planning, Building and Environmental Services department — which regulates winery development projects — about 500 acres of land is being converted to vineyards annually in the county. Local officials have estimated that 10,000 more acres could be converted to vineyards by 2030. As for Swain's contention that Napa County is nearing capacity for new vineyards, Morrison said that an additional 88,000 acres of the county's undeveloped land have soil types suitable for planting vines. Oak woodlands occupy about 162,000 acres in Napa County. Most vineyard projects are relatively small — anywhere from three to 40 acres. Others are huge, like the plan of a wealthy Texas couple to cut down 14,000 oak trees on more than 200 hilly acres northeast of the city of Napa. The county Board of Supervisors approved the Walt Ranch vineyard expansion in December, prompting several lawsuits that have stopped the project for now. The Center for Biological Diversity jointly filed one suit with the Sierra Club on the grounds that the huge vineyard project would deplete groundwater reserves, reduce local stream flows, pollute reservoirs with pesticides and fragment wildlife habitat. The suit, filed against Napa County, contends that county officials approved inadequate measures to mitigate potential impacts. Anderson, the Napa activist, walked me through a grove of trees in Las Posadas State Forest, the preserved remnants of a wooded region that’s been fragmented by vineyards. She came to a deer fence surrounding a property owned by Bremer Family Winery. Across the recently cleared land, piles of Douglas fir and ponderosa pine logs were heaped beside a yellow bulldozer. For Geoff Ellsworth, a city council member in St. Helena at the north end of the Napa Valley, the wine industry's success has come at a high cost. "There is deforestation on a large scale occurring in the North Bay," said Ellsworth, contending that county agencies are excessively lenient toward proposals to convert woodland into vines. The wine industry, he said, is "out of control." Brian Bordona, Napa’s supervising planner, said he believes the county is adequately protecting the landscape. "We comply with the [California Environmental Quality Act]," Bordona said. 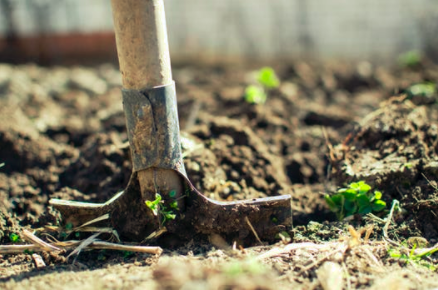 The law Bordona cites, usually referred to as CEQA, can involve site inspections, lengthy reports and mitigation measures to offset the impacts of a given development project. But Anderson and others maintain that this review has numerous loopholes and procedures vulnerable to abuse. "The project developers just have to hire a biologist and a forester to come out here, have a look around and say, 'Nope — there's nothing out here, so these trees can come down,'" Anderson said. You should have that right to convert your land to a profitable use. According to Bordona, projects of 5.5 acres or less sometimes may be waived through by county officials with virtually no review at all — an allowance that has environmentalists concerned about cumulative damage. Activists Hackett and Wilson co-authored the Water, Forest and Oak Woodland Protection Initiative, a 2016 ballot proposal to increase protections for streams and forests in Napa County. Much of the winemaking community opposed the initiative, and although its supporters acquired more than 6,000 signatures to put the measure on last November's ballot, county officials ultimately prevented it from going to voters on a technicality. Winemaker Stu Smith, co-owner of Smith-Madrone Vineyards and Winery, views his relationship with the land from a straightforward economic perspective. He believes that if growing grapes is profitable, little, if anything, should stop a property owner from replacing trees with vines. "You should have that right to convert your land to a profitable use," said Smith, who bought his property in the early 1970s. "That’s what capitalism and the free market system are all about. We’re not a communist country." Smith predicts that market forces eventually will drive Napa property owners to convert their undeveloped land into vineyards or subdivisions. Napa environmentalists say that would be tragic. Standing on a roadside about 1,000 feet above the Napa Valley, Anderson, Hackett and Wilson look across thousands of acres of forest on steep slopes that drain into the Napa River. "This is, unfortunately, ground zero for where these winemakers are going," Anderson said. "I can assure you, if you cut these trees down, you can grow the finest cabernet on the face of the earth."